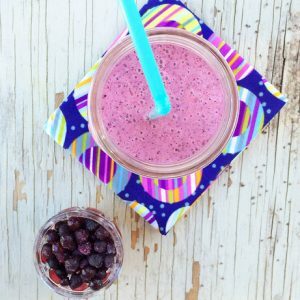 This healthy smoothie recipe is made with frozen Wild Blueberries, frozen mango, chia seeds, Greek yogurt, and orange juice, and it’s an easy snack for kids and families. I’ve been on a bit of a wild blueberry binge since returning from a three-day trip to the wild blueberry barrens of Maine last month. 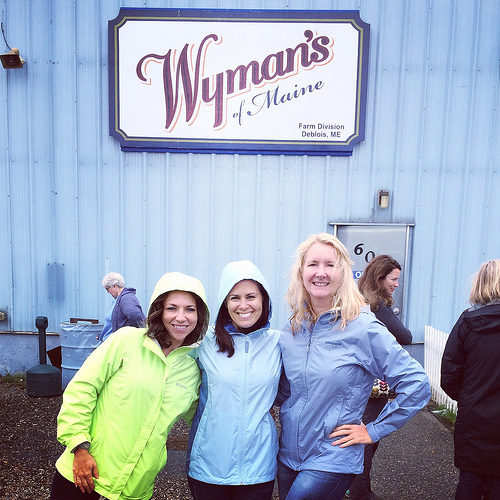 Surrounded by thousands of acres of low-lying wild blueberry bushes and stunning views from our home base of Bar Harbor, I was joined by fellow food and nutrition bloggers and top-notch growers, harvesters, processors, and researchers. Read on for some behind-the-scenes images from the tour as well as my newest recipe for Wild Blueberry & Chia Seed Smoothie. 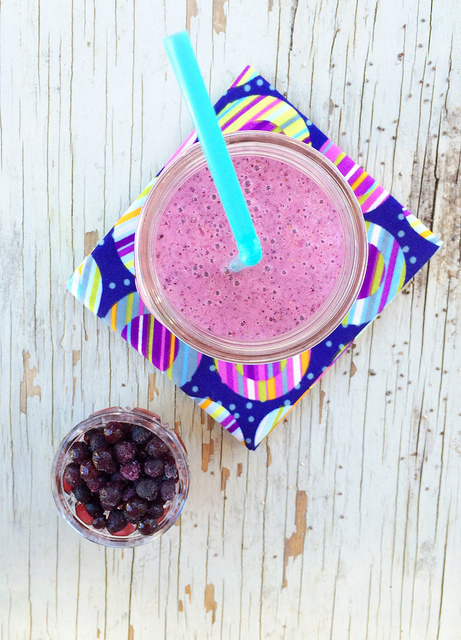 This Wild Blueberry and Chia Seed Smoothie is nutritious + delicious! 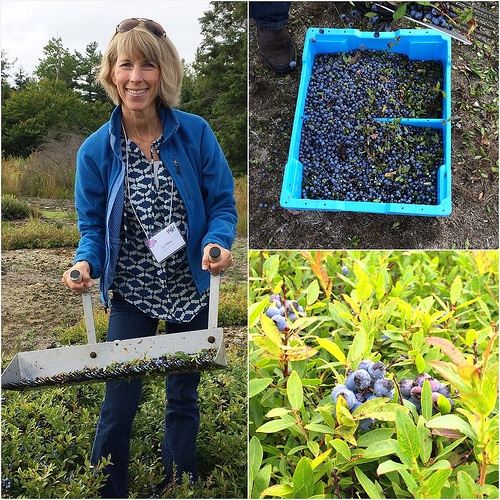 The Wild Blueberry Association of North America hosted my trip, and as you can see, they put me to work harvesting blueberries by hand. 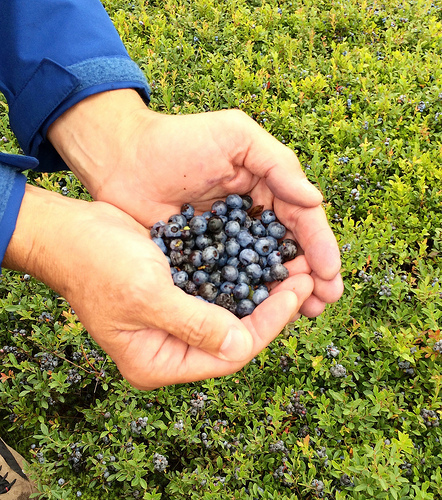 While most wild blueberries are harvested nowadays by machines, sometimes the terrain dictates a hand rake! Here’s the harvester! 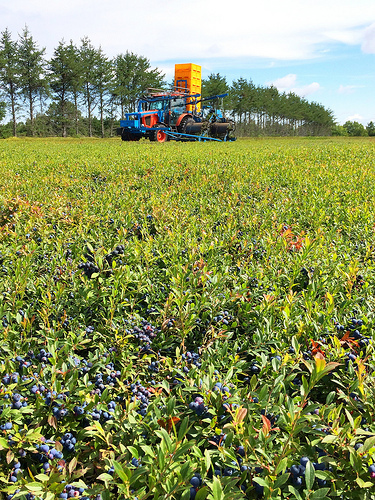 At Cherryfield Foods, they harvest three million pounds of wild blueberries a day during the growing season, which is actually coming to an end. But there’s no need to be sad, because well over 95% of the fruit is frozen. So you can find wild blueberries year round in your supermarket freezer section. The ingredients are simple: frozen blueberries, frozen mango, vanilla Greek yogurt, orange juice, and chia seeds. The great thing about smoothies is their ease as well as their ability to pack in a lot of nutrition quickly. Place the orange juice, yogurt, blueberries, mango, and chia seeds in a blender, and blend until well combined. Now, back to my trip to Maine. 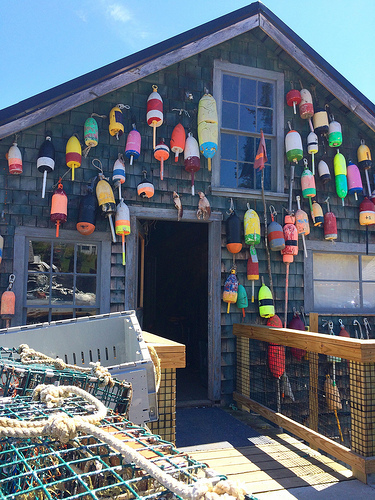 Besides blueberries, when I think of Maine, images of sailboats and beautiful views come to mind, and so do succulent lobsters, gnarly traps, and colorful buoys. 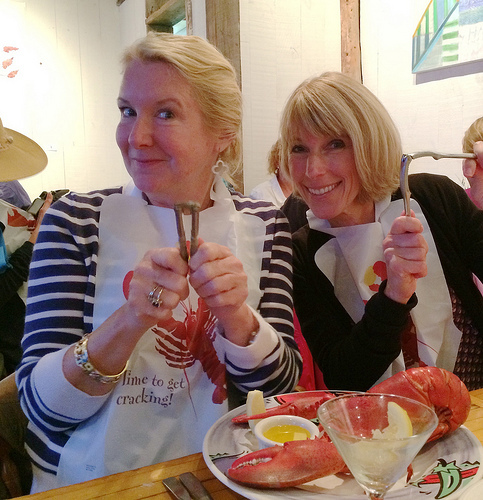 Lob-Stuh dinner at Islesford Dock Restaurant on Little Cranberry Island. 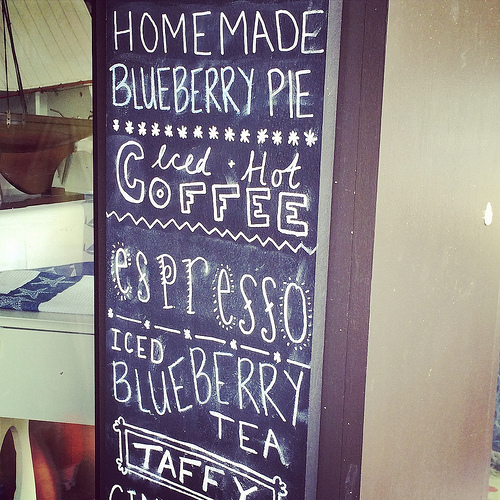 Everywhere you turn in Bar Harbor are wild blueberries: pie, iced tea, ice cream, you name it. 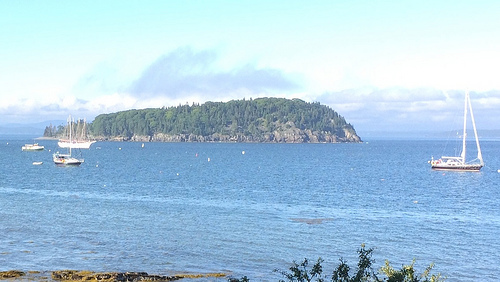 Goodbye Bar Harbor: View from our hotel, the Bar Harbor Inn. 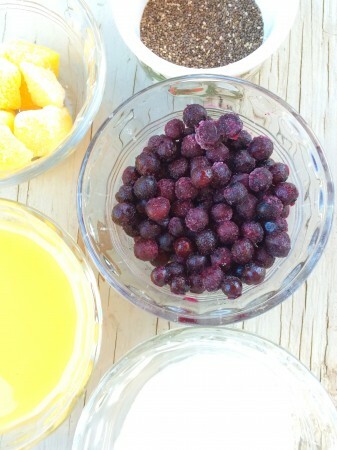 Love me some wild blueberries – so fun to see all your photos and I have to get some chia seeds in my pantry very soon! Look at you, deckout out in blue’berry’ harvesting these tiny power packed berries by hand! Sounds like a wonderful experience!!! Love your smoothie; nice idea for recovery from a glycogen depleting sport! The color of that smoothie is incredible! And blueberry iced tea?! Sign. Me. Up. Wow! Looks like an awesome trip! I have always wanted to go to Maine! 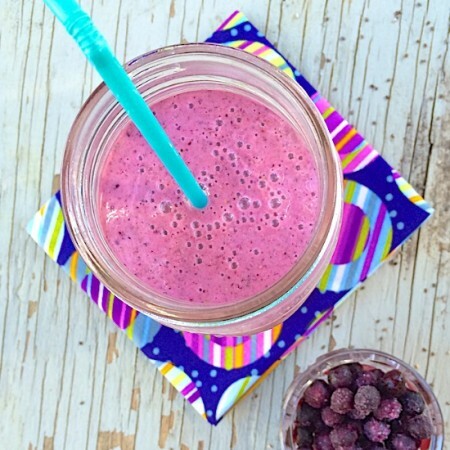 This smoothie looks so refreshing! I almost always have wild blueberries in my freezer- can’t wait to make this in the coming weeks! I’m really trying to decrease my sugar intake. Is there something other than orange juice that I can substitute?